More than 60 years after Baird Drive, the connecting road between Porter Avenue and the Peace Bridge Plaza, opened, it is being shut down. Assemblymember Sean Ryan believes it is a huge win for nearby residents and park users. Baird Drive will be removed as traffic is re-routed from Front Park. "Right now if you're exiting the Peace Bridge, and you would like to get to the 190 North, you have to drive through Front Park on Baird Drive. 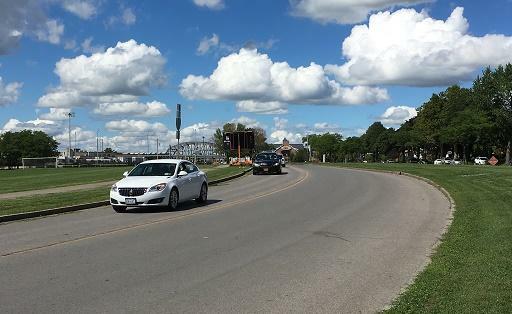 If you're a City of Buffalo resident trying to get on the Peace Bridge, you have to drive through Front Park, on Baird Drive, to get to the Peace Bridge," Ryan said. Starting next Tuesday, September 6, a new on-ramp from Porter Avenue will open that carries bridge traffic around Front Park. Baird Drive will then be ripped out. "The physical removal of this drive may also remove some of the psychological impacts which has disconnected this park from the community," said Stephanie Crockatt, executive director of the Buffalo Olmsted Parks Conservancy. "It's consistent with the values of Olmsted that this restoration gives these beautiful homes along Busti Avenue their park front property once again." By removing the road more than four acres, or about 20 percent, of the historic park will be restored. Niagara District Councilman David Rivera says all the road improvements near the bridge are designed to keep trucks away from homes. "We don't want truck traffic idling. We want truck traffic moving along," Rivera said. "That was the goal, to move whatever traffic that was there on to its destination, in the quickest amount of time, imposing less health issues to the neighborhood."